The nail unit is a highly specialized structure of skin. Certain tumours and other complaints prefer this unique organ. 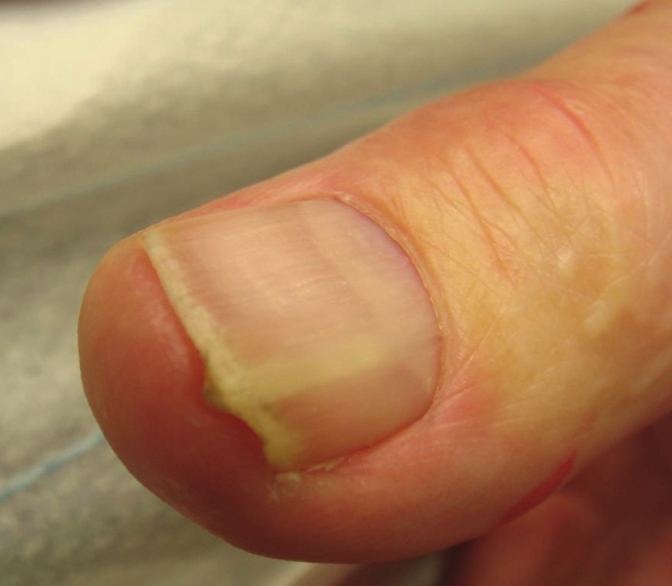 We observed a 71-year-old male who presented with a slowly progressive longitudinal ridge-like thickening of the nail plate of his left thumb [Figure 1]. Under pressure the lesion was a bit painful. The nail plate thickening was restricted to the ventral layer adjacent to the nail bed, whereas the visible dorsal surface was unaffected. Our primary suspicions were onychomatrixoma, onychopapilloma, or glomus tumour. We performed nail surgery with a proximal finger block using 1% xylocaine. The plate was cut longitudinally along the ridge. Then we removed the thickened part starting from underneath the proximal nail fold by the help of a nail elevator [Figure 2]a. A soft tissue tumour was found in the lateral part of the lunula that extended to the tissue of the proximal nail fold. After incision of the proximal fold and further meticulous preparation, the tumour could be completely surgically removed leaving the proximal matrix untouched [Figure 2]b and c. The remaining nail plate was sutured in the midline as a protective shield of the wound bed [Figure 2]c. We performed antibiotic prophylaxis with 2 × 500 mg/d cefuroxim. Healing was uneventful [Figure 2]d.
Histopathological investigation revealed an angiomatous malformation composed of venous and arterial vessels [Figure 3]a and b. The diagnosis of an acquired digital arterio-venous malformation (ADAVM) was made. This makes our case unique. The lunula is a whitish half-moon shaped structure known for a poor vascularisation compared to other parts of the nail organ. Magnetic resonance imaging (MRI) investigations have shown a loose connective tissue with reticular and subdermal vascular networks that develop larger meshes. , This can dramatically change in case of trauma or systemic inflammation. , We suppose that trauma might have been responsible for ADAVM in our patient. Treatment for finger tip ADAVM can be realized by neodymium: Yttrium-aluminium-garnet laser or surgery. , Surgery was preferred in our case with unusual presentation supporting histological examination. 1. Yang CH, Ohara K. Acquired digital arteriovenous malformation: A report of three cases and study with epiluminescence microcopy. Br J Dermatol 2002;147:1007-11. 2. Cuesta Montero L, Soro P, Bañuls J. Acquired digital arteriovenous malformation: Clinical, dermoscopy, ultrasound and histological study. Eur J Dermatol 2012;22:138-9. 3. Bekhor PS, Ditchfield MR. Acquired digital arteriovenous malformation: Ultrasound imaging and response to long-pulsed neodymium: Yttrium-aluminium-garnet treatment. J Am Acad Dermatol 2007;56:S122-4. 4. Kadono T, Kishi A, Onishi Y, Ohara K. Acquired digital arteriovenous malformation: A report of six cases. Br J Dermatol 2000;142:362-5. 5. Wolfram-Gabel R, Sick H. Vascular networks of the periphery of the fingernail. J Hand Surg Br 1995;20:488-92. 6. Drapé JL, Wolfram-Gabel W, Idy-Peretti I, Baran R, Goettmann S, Sick H, et al. The lunula: A magnetic resonance imaging approach to the subnail matrix area. J Invest Dermatol 1996;106:1081-5. 7. Richert B, Di Chilacchio N, Haneke E. Nail Surgery. London, New York: Informa Healthcare; 2010. 8. Wollina U, Barta U, Uhlemann C, Oelzner P. Lupus erythematosus-associated red lunula. J Am Acad Dermatol 1999;41:419-21.